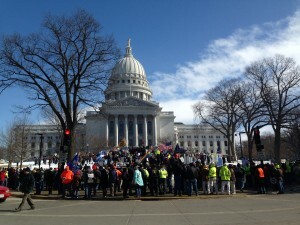 Stop “Right To Work” For Less in Wisconsin! Stop the Cuts! Reverse All Attacks on Workers’ Rights! Protest, Occupy, Strike! Below is the text of a leaflet Socialist Alternative is handing out at the protests in Madison, Wisconsin. “Right to work”, which already exists in 24 states, mostly in the south and west, places serious restrictions on unions and will directly contribute to significant sections of the remaining unionized workforce being de­unionized. Four years after Walker’s assault on the public sector unions and the uprising that followed, right to work legislation is on the fast track to becoming a reality in Wisconsin. The state legislature has called an extraordinary session ensuring little opportunity for public input. The “right to work” legislation comes just weeks after Walker put forward a budget representing massive escalation of austerity: $300 million cut for the University of Wisconsin system, $127 Million in K­12 Education Cuts, privatization of education through expanding voucher and charter schools, as well as an end to state aid to the Parks system all while rewarding big business with tax cuts and $220 million for a new Milwaukee Bucks Arena. At a time of ever deepening crisis of inequality, these cuts will only escalate the driving down of living standards for workers, students and the poor and transferring more and more wealth from the bottom to the top. Massive anger and opposition is building at how the GOP is overplaying their hand. In the struggle of 2011 we saw demonstrations twice a day for weeks on end, culminating in a massive demonstration of over 200,000 people. We saw a month­long occupation of the state Capitol, and a second occupation later on. We saw sick­outs, walk­outs, and teach­outs. Public opinion was on our side and the workers were ready to fight. 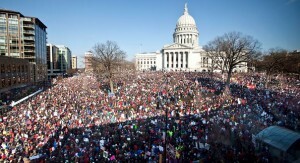 But, Walker still won and the public­ sector unions were dealt a major blow. At the time, Socialist Alternative called on the unions to escalate the action by calling a one­day, statewide, public sector general strike as a step to further action. Such a strategy could have stopped Walker and his cronies in their tracks. Instead, the union leadership diverted the struggle in the streets to an electoral struggle on behalf of the Democratic Party, the other party of big business. In the recall election of 2012 and the re­election campaign of 2014, Walker faced off against Democrats Tom Barrett and Mary Burke, both of whom had a reputation for attacking workers’ rights. In such a situation, Walker was able to survive both elections unscathed and the workers of Wisconsin have paid the price. Unfortunately, the labor leadership has not learned the lessons of 2011. Rather than looking to the strike weapon, they look to “allies” in the Wisconsin Contractor Coalition, a coalition of 350 contractors who hire union labor. Rather than arguing for workers rights, they argue: “The long history of partnership between the contractors and the trade unions is not something either side wishes to see put through the legislative meat grinder.” (Union Labor News, February 2015) But it is precisely this long history of partnership between union leaders and employers which has lead to the decimation of the labor movement over the past few decades. The confidence of the Republicans is not surprising given that the labor leadership has refused to fight back with a strategy that can win. Legal challenges, doomed recall efforts, and a reluctant Democratic Party cannot defeat “right to work” measures. Only a united working class and a fighting approach can win. The calls for protest from the AFL-­CIO this week are a great start. But as the experience of 2011 shows, marches will not be enough to defeat Walker and the GOP’s agenda of endless cuts and attacks on workers rights. Strikes, occupations, and mass civil disobedience will be necessary to defeat “Right to Work” and reverse the rightwing anti­worker onslaught of the last few years. These are tactics that will require reaching out to the rank and file of the unions, not corporate politicians and law firms. 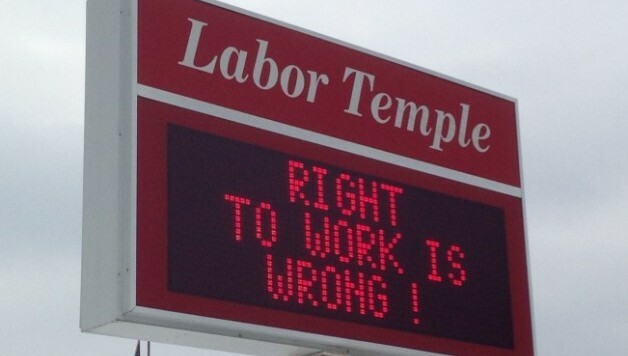 ● Stop “Right to Work”, Reverse Act 10, restore full union rights for working people. ● Fight the Cuts! Tax the millionaires and billionaires to fully fund social services. ● Unions to organize emergency mass meetings for democratic discussion to prepare for escalated protests and direct action in the streets, government buildings and workplaces. ● Build up to coordinated, statewide strike action. ● If the union leadership fails to organize such a strategy, rank and file union activists to form their own committees to fight for a strategy to win.